Do you always feel hard to organize your pantry and kitchen? 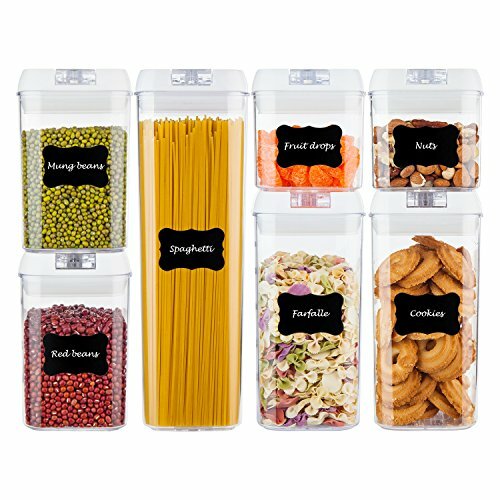 Why not choose our airtight food storage containers, they will make it easy for you to organize your pantry. 1. Made of durable plastic material, our flour storage container will be a great helper for you to organize your pantry. 2. The top is wide enough to take out food easily , you also can get your measuring cup or spoon in to measure. 3. Outside measurement markings make it much easier to know exactly how much food left and determine whether it requires replenishment. 4. With special design airtight lids, these plastic containers not only can keep your food fresh, but also keep the bugs out. Help Organize Your Kitchen and Pantry----Imagine waking up every morning and walking to the kitchen to make some breakfast, found everything is neatly organized. No longer messy, you can get everything you want very quickly. With square shape and stackable modular design, our food storage containers will make it is easy for you to organize your kitchen and pantry. One Set Include 7 Pieces Plastic Food Storage Containers----These airtight containers come in a variety of sizes, which can meet all of your kitchen dry-storage needs. Include 1 Tall Container (1.7qt / 1.9 liters), 2 Medium Containers (1.1qt / 1.2 liters), 2 Small Containers (0.7qt / 0.8 liter), 2 Mini Containers (0.5qt / 0.5 liter). Perfect for storing flour, sugar, rice, grain, nuts, beans, snacks, pasta, coffee, tea and even pet food! Clear containers allow you to identify contents----Made of high quality BPA free material, our air tight containers are durable and shatterproof. The plastic of these containers is very clear, you can identify the contents without opening them. Outside measurement markings make it much easier to know exactly how much food left and determine whether it requires replenishment. Air-Tight to keep food dry and fresh----With special sealing mechanism, you can open or close our plastic containers safely by using only two fingers. Simply flip the ring to open or flip the ring down to lock and seal. Airtight dry storage system will always keep things fresh, also protect your food from bugs. Easy to clean and dishwasher safe. 24 Free Chalkboard Labels and 1 Marker----Except 7 cereal storage containers, you will also receive 24 pieces labels and 1 marker, which will help you never confuse flour with powdered sugar or baking powder with baking soda. They are reusable, you can switch contents whenever you need. Just wipe clean with a damp cloth to change what you have written, Peel and Re-stick. If you have any questions about this product by Vtopmart, contact us by completing and submitting the form below. If you are looking for a specif part number, please include it with your message.